You can book your taxi by phone at +32.71.21.99.99 or mobile phone and text at +32.471.21.99.99. Most of credit and debit cards are accepted ( VISA, MASTERCARD, VISA ELECTRON MAESTRO). You can pay your trip by bank transfer to our account number …………………………………. Several days before your travel. A confirmation of payment will be sent to you. 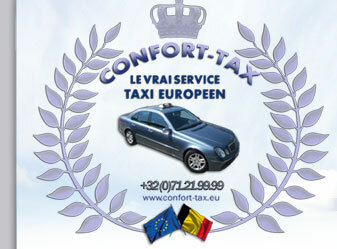 Choose Confort-tax for different trips and celebrations ( job, parties with friends and family, restaurant, night clubs, birthday, baptism, wedding, airport and hotel shuttles, remote trips etc… ) we have the right solution for you. In fine, we safely drive you everywhere you want to go. Please contact us for any request.